The best B12 supplement will provide high product purity, excellent nutritional value and ingredient safety, and a good value for each dose. Find out why label accuracy and the safety of inactive ingredients found in B12 supplements can also be important in addition to heavy metal screening. 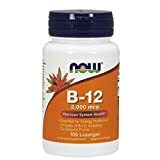 When considering different B12 supplements for this list, we referred to laboratory testing for the best B12 supplement regarding both quality and value. We also took into consideration the kind of B12 included in the supplement and the overall ingredient safety. Supplements are not always regulated well, and label accuracy is another factor we took into account for the ratings on this list. We also reviewed the cost per serving, inactive ingredients, and whether or not the product passed a heavy metal screening. With all of this information in hand, we reviewed the data to remove outliers and cross-referenced information to make sure it was accurate. We also looked at brand reputation, customer feedback, and the level of customer service reported by customers. 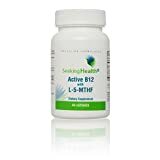 The best B12 supplement will have accurate information on its label and also offer up a suitable dose of B12 for an adult. The appropriate daily dose of B12 for an adult is 2.4 mcg; however, you will find that most supplements provide a much larger dose. Larger doses are generally ok because B12 is a water-soluble vitamin and that means your body will pass whatever it is unable to absorb. If you are unsure what dose is safe, or if you have existing health conditions, it is a good idea to consult with your doctor before taking the best B12 supplement. The timed release formula of Nature Made B12 tablets contain no artificial colors, flavors, or preservatives and are also gluten-free. You can take them any time, and the timed-release formula works to help your body absorb more of the supplement throughout the day. It is recommended to take this 1000 mcg dose of B12 with a meal, which is excellent news for those that dread swallowing pills. This tablet is also free of yeast, and starch, and is approximately half the diameter of a penny in size. 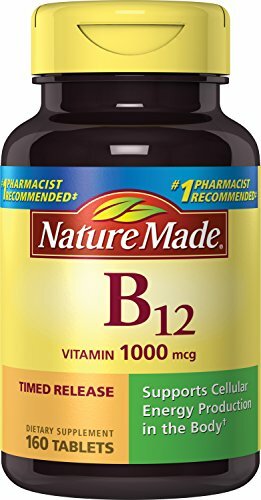 Nature Made B12 is one of the best B12 supplements in part because it is pure, has an accurate label, and high nutritional and ingredient safety. It also passes heavy metal screenings and is an excellent value per serving. 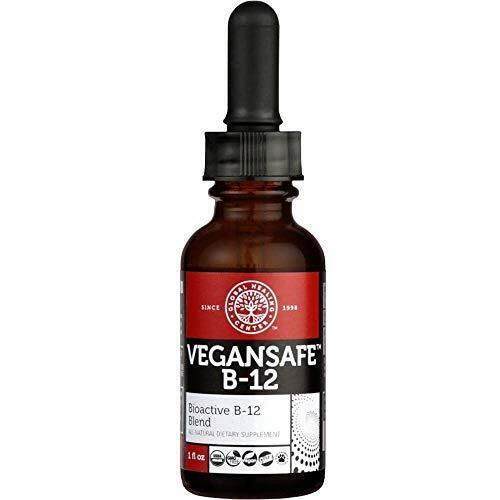 Vegan Safe is a B12 blend that provides 2500 mcg of B12 per 1ml of liquid. The dropper makes this supplement easy to take and contains a combination of adenosylcobalamin and methylcobalamin which makes it easier for your body to absorb. This supplement is made in the US and follows Good Manufacturing Practices (GMP) in a facility that is also eco-friendly. It is also certified organic, gluten-free, cruelty-free, and is vegan and vegetarian-friendly. Users report the liquid tastes good and is easy to use with the included dropper. This supplement is intended to be taken on an empty stomach earlier on in the day, and few users report any stomach or other issues following this practice. 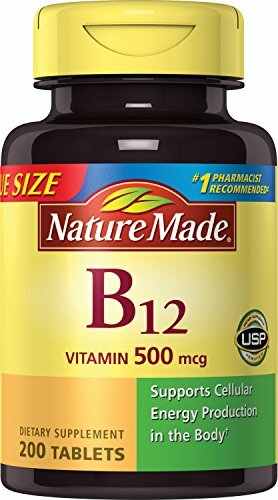 Nature Made also makes an excellent B12 supplement aside from their extended release option. This supplement also contains no artificial colors, flavors, or preservatives, and is also free from gluten yeast and starch. One dose supplies 500 mcg of B12 and tablets should be taken with a meal. Nature Made has also created their products using ingredients verified by the independent organization USP. The tablet is quite small with a diameter roughly half the size of a penny. This supplement also includes a small amount of Calcium equivalent to 8% of the recommended daily value. While this product has a high purity level and provides excellent nutritional value and ingredient safety, the label could use some improvements to increase accuracy. This supplement provides an attractive price per serving and also passes heavy metal screening tests. 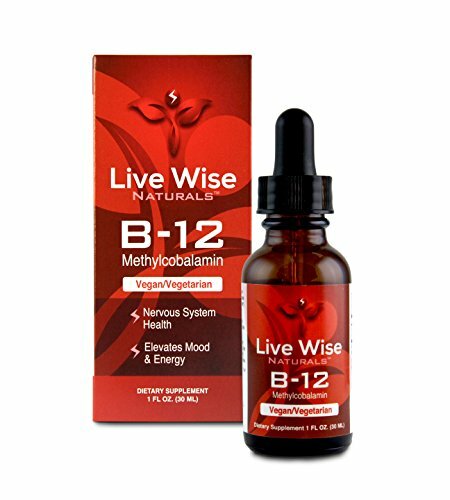 Live Wise Naturals is another great option on our list of best B12 supplements due to its excellent purity, nutritional value, and ingredient safety. While the price per serving is higher than the tablets on our list, it provides a significantly higher amount of B12 without the need to swallow a pill. This supplement is taken orally as a liquid, which Live Wise claims will help to aid in absorption. By putting this supplement under the tongue, the organic grape alcohol in this product can stimulate tissues found in the mouth and deliver the ingredients into the bloodstream more quickly. This supplement starts out with high-quality raw ingredients and doesn't contain any dairy, soy, added sugar, gluten, flavoring, synthetic preservatives, fillers, or dyes. The simple list of ingredients includes purified water, organic grape alcohol, and 100% Methylcobalamin. To further preserve the efficacy of this product it comes packaged in amber glass to protect it from oxidation. The Now Foods B12 supplement features a mix of three different forms of B12 to help improve absorption rates. With a low price per serving and 100 servings in a package, this supplement provides high nutritional value, ingredient safety, and purity at a reasonable price. The family owned and operated company has been running since 1968. Their focus on sustainability, quality, testing, and charity have helped them become a leading brand in the supplement industry. This supplement contains 2000 mcg of B12 and comes in lozenges that are cherry flavored. Fructose and maltodextrin are used as sweeteners in these once daily lozenges. Moreover, they can either be chewed or allowed to dissolve in the mouth. 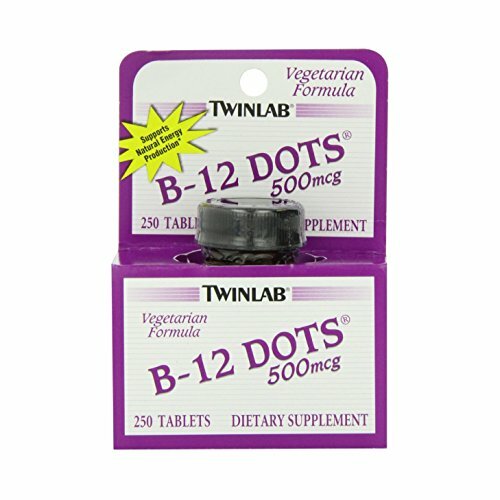 Twinlab B12 Dots are unique cherry flavored dots that contain 500 mcg of B12 each. A daily dose is one small dot which should be dissolved in the mouth and swallowed. The dots are manufactured in the US, and each bottle contains 250 dots that are vegetarian. They also contain no artificial preservatives, colors or added sugar. The dots are not gluten free which may be a problem for some; however, they are a high-quality product concerning purity, nutritional value, and ingredient safety. This supplement also has a very low cost per serving and has passed heavy metal screenings. Nature's Bounty offers a high level of purity in its product. It also contains a high level of nutritional value and safe ingredients; however, its label could be improved for accuracy. With 5000 mcg of B12 in each dose, it provides a high number of vitamins in a small amount of liquid. The liquid has a natural berry flavor and is placed under the tongue to maximize absorption before being swallowed. This product also contains potassium sorbate as a preservative, sorbitol, vegetable glycerin, and purified water. Users report liking the flavor of the liquid, and several noted that they feel a boost of energy after taking it. The sweetness of this product has been mentioned as being somewhat inconsistent from bottle to bottle. Seeking Health B12 lozenges are a great example of a pure product with high nutritional value and ingredient safety. The lozenges pass heavy metal screenings and are moderately priced based on a serving. Each lozenge contains 800 mcg of B12 and is free from allergens such as eggs, fish, milk, shellfish, nuts, wheat, and soy. The lozenges are cherry flavored and also contain folate to increase absorption. The sweetener used is xylitol, and there are no artificial preservatives, colors, or flavors. The lozenges can be chewed or allowed to dissolve in the mouth. They can also be broken into smaller pieces for consumption throughout the day. Seeking Health lozenges are also quite small with a diameter approximately half the size of a penny. B12 is a vitamin found in a variety of animal sources that many individuals consume as part of their regular diet. If you don't eat animal products, you may want to consider a B12 supplement to prevent deficiency. Early signs of a B12 deficiency include fatigue, nausea, and digestive issues. A simple blood test can determine if you are deficient in B12 and a variety of supplements are available to help increase your B12 levels if needed. B12 works to protect nerve cells from free radicals, and also helps in the process of producing healthy RNA and DNA which is the body's genetic material. Along with other B vitamins, B12 can also be a vital part of creating red blood cells, protecting the cardiovascular system, supporting immune function, and helping you to improve your mood and overall energy levels. There are different kinds of B12, and each form is a little bit different. How much B12 you absorb through a supplement may vary based on the person but is generally around 56% of a 1 mcg tablet when taken orally. 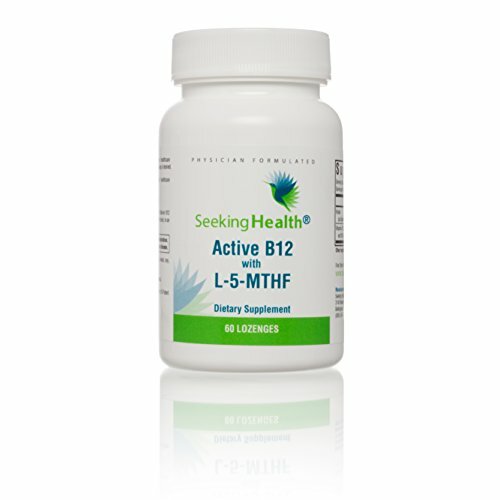 Most B12 supplements will come in the form of cyanocobalamin which is primarily considered to be one of the best kinds. Cyanocobalamin easily converts into a sort of B12 that your body can more efficiently absorb and splitting a daily dose into smaller doses throughout the day can help increase absorption. When looking for a B12 vitamin, we recommend considering the value of each dose with respect to your individual needs. You may also want to confirm the accuracy of a product's labeling by looking at third-party tests. Dietary supplements are considered food under the rules of the FDA. Which means that they are under very different regulations that drugs would be. Since supplements are not drugs, they are considered safe until it can be proven otherwise. And this can make them potentially lower in quality. Quality supplements will traditionally include some third-party testing verifying their quality, ingredients, and availability of different nutrients. If the supplement you are considering does not provide this information, there are other resources online that can help. One of these resources is Labdoor.com which is a site that has conducted various tests and compiled information about a variety of different products on the market. Full reports are available on these tested products, almost always for free. They also include relevant information such as product purity, the safety of ingredients, label accuracy, nutritional value, and projected efficacy. Different brands will charge different amounts for their products regardless of whether they are a liquid, spray, tablet, or lozenge. For a useful B12 supplement you'll want to make sure that each dose contains enough of the vitamin for your body to absorb enough each day. Lower doses around 500 mcg should be sufficient; however, they should have a lower cost than supplements that contain much higher amounts. A higher quantity of B12 does not guarantee your body will absorb more. And may also end up being passed by your body. How much B12 needs to be consumed will vary from individual to individual. If you have had testing done to determine if you are B12 deficient you should ask your doctor how much B12 you should aim to consume in a supplemental form each day. Frequently, supplements will contain several times the recommended daily value of B12; however, this does not mean that your body will absorb all, or even most of it. Absorption rates will also vary based on the individual but consuming too much B12 in a single dose is unlikely. You’ll also want to consider how you would like to take your B12 supplement. There are liquids, lozenges, sprays, and tablets available. Based on how you prefer to consume your supplement, and the time of day you wish to take it. You should be able to find a high-quality product to meet your needs. If you are frequently on the go. You may want to consider a supplement that does not need to be taken with a meal. There are also supplement “dots” that are more akin to candy and lozenges. For those who prefer a supplement that is more similar to hard candy.